Are you looking to tick climbing the highest freestanding mountain off your bucket list… then why not join us and our group of intrepid adventurers as we trek to the very roof of Africa. If your interested in joining the team in February 2018 please email us on info@operationuganda.org for a full info pack. 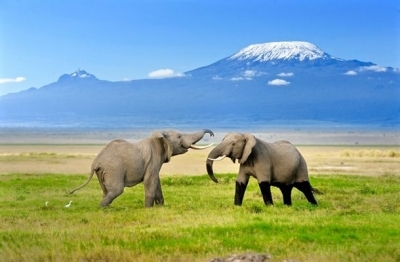 Today, you arrive at Kilimanjaro Airport (JRO). You will be met at the airport by a team representa ve and transferred to the team hotel. Depending on your me of arrival, we will meet for a team dinner and sleep overnight . Today is a day of leisure, allowing you to se le into the relaxed African lifestyle. Forget about your watch, you are now on African me. Your Trip Leader will deliver a thorough briefing regarding daily routines, timings, altitude, safety and other important topics. A final gear check will be done before you will have the chance to head out for any last minute supplies. Early to bed tonight in anticipation for the start of an amazing adventure. Leave M Mkubwa a er breakfast to Shira 1 Campsite. We will stop for lunch on the way. 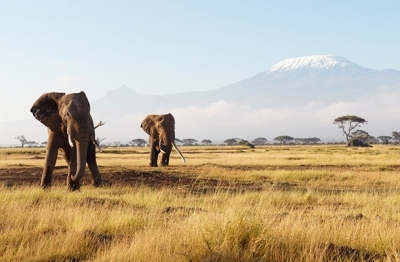 Along this stage the weather becomes drier whilst the terrain consists of tall grasses, heather and volcanic rock whilst o ering views of Kibo. Dinner and overnight at Shira 1 campsite. Leave Shira 1 Camp a er breakfast to Shira 2 Camp with picnic lunch on the way. The Terrain here is rela vely at and easily from Shira 1. It covers more heather and moorland zone abundant with wild owers and unique Senecio trees. Dinner and overnight at Shira 2 campsite. Leave Shira 2 campsite a er breakfast to Baranco. The terrain here is more of alpine desert zone and moorland desert zone especially in the Baranco valley. We will be able to reach lava tower at 4600m. The vegeta on here features the stunning and unique Senecio trees and Lobelia plants around the campsite. You will arrive in Baranco at the same height that you started, however due to the climb above 4000m, this day is extremely important as it helps you acclima se and prepare for our upcoming summit bid. Dinner and overnight in Baranco camp. After morning breakfast we leave Baranco climbing out of camp via the Baranco Wall. It is a comfortable yet stunning rock scramble ascending rapidly gaining 300m of ascent. 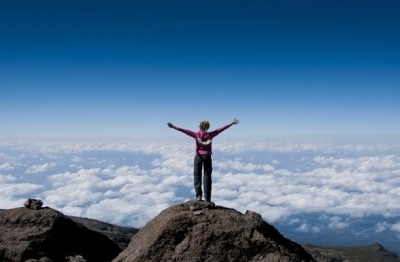 It is a safe climb with many at view points along the way. We con nue short climbs and descents before reaching the top of a ridge which a ords us open views across to our camp. The vegeta on is more Alpine desert whilst the air is very dry requiring you to take more water. This is a true highlight of the trek in and one of those days you will never forget. We leave Karanga Camp to Barafu Camp where we connect at a junc on with the Mweka Trail then con nue up to the Barafu Camp (4673m). You will be o ered views of the summit from many di erent perspec ves. We nalise our permit at Barafu before con nuing on, climbing through switch backs of scree and rock to our private camp at Kosovo. Once in camp, we are able to see our climbing route all the way to Stella Point, with unobstructed views across to Mawenzi Tarn, the 2nd highest peak and ex nct volcano. We will get some much needed rest and food before we prepare for our acclima sa on walk or summit push depending on how the team is feeling. Dinner and overnight at Kosovo Camp. After breakfast we leave Kosovo Camp accompanied with picnic lunch boxes. We will head up the steep, switch back route of scree and rock leading up to Stella Point (5756m). Depending on how the team is feeling, or for those who want to con nue, we have the op on to head directly for the summit from Stella Point, which is only a short 1 hour push from there. 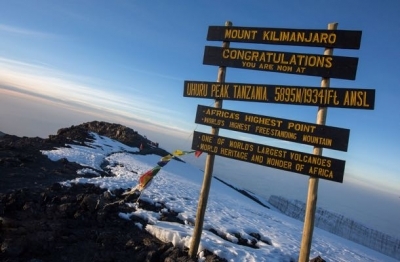 For those that just wish to gain a few hundred metres of altitude from camp, and then head back to camp to rest and prepare for the summit the following day, that is also an op on. Many climbers enjoy climbing together as a team and will often make the decision depending on how the team are feeling overall. Dinner and overnight at Kosovo Camp. We eat an early breakfast and leave camp, bound for the summit at around 4am. We are aiming to reach Stella Point before sunrise so that we a orded incredible views as the planet wakes up with brilliant red rays ltering through with the Mawenzi in the forefront. This really is one of life’s great moments and a sunrise you will never forget. From there it is a short push to Uhuru at 5895m. 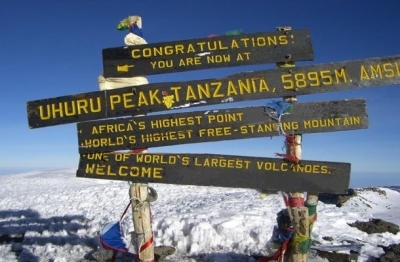 You will be now standing on the roof of Africa, on the summit of the highest freestand- ing mountain in the world. Time to grab your photos, call your loved ones or just take in the experience. After taking in the amazing views, along with an unbelievable sense of pride you will be feeling, we commence the descent down to Kosovo Camp for a hot lunch before con nuing on to Mweka Camp. After breakfast leave Mweka Camp which takes between 3 to 4 hours. 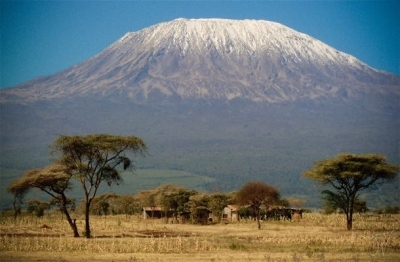 A er clearance and being awarded with your Certificate acknowledging that you have reached the highest Peak of Africa, we then transfer back to our hotel in Moshi for a much deserved hot shower and group celebra on. After breakfast, your trip concludes. 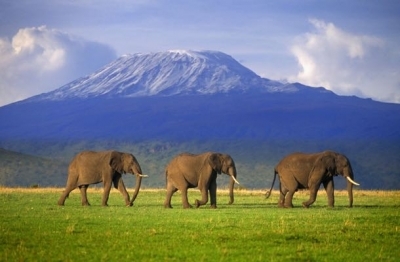 You will be transferred to Kilimanjaro International Airport for your departure home. We will be sad to see you go!